Can you believe it’s October already? I’ve noticed that everyone now keeps telling me how many weeks are left until Christmas arrives. 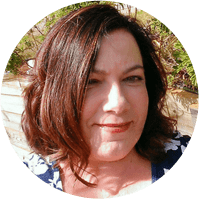 I can’t say it fills me with a whole lot of excitement just between you and me, such a hectic time of the year (and dare I say often stressful), especially when you have 4 year old twins! No, I think I will just hang onto October a little longer thanks and please don’t tell me if you are one of those organised parents who has already picked up their Christmas layby because I seriously do not want to know! Let’s get back to October because if you have budding little Doctors in the house like I do they might be excited to hear that October is Doc-Tober for the Disney Junior channel on TV. There will be new episodes of Doc McStuffins and her toy friends throughout the whole month which I’m personally quite pleased about because my girls absolutely love Doc. 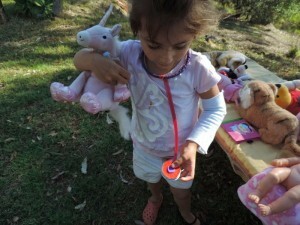 I think they truly believe she brings her toys to life with that magical stethoscope and is a real Doctor just like her Mum and the Doctor we visit when they are sick. I like that Doc McStuffins shows such kindness to her toys and promotes teamwork, which is often something we talk about here in my family day care service. 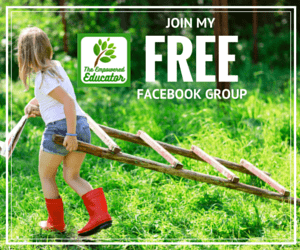 Regular readers will know that my girls love their outdoor play and it is something I am very passionate about. We really don’t watch a lot of TV but I do believe there can be a healthy balance if shows are chosen wisely. I allow them to watch the Disney Junior channel mainly because I know I will be able to trust the content and to be honest every now and then I love being able to sit with them and watch some of the classic Disney movies that I grew up with. Their current favourite show, Doc McStuffins, encourages them to role play and use their imagination and I so enjoy watching my girls get out their Doc kits to fix their poor toys whenever an episode finishes. 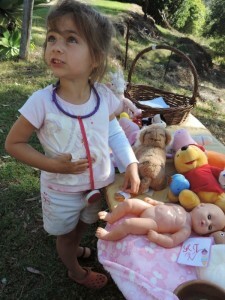 Usually the play moves to outside and we often have hospital clinics set up in some very odd places! Disney Junior has just introduced a range of new games and activities to their website and I particularly like the just released Doc-Mobile game . The twins have really only just begun to explore games on the computer, I figured I can’t keep them away from technology forever but I’m pretty choosey about sites I let them visit. This one was easy to understand, didn’t require a lot of mouse control and it led to a wonderful afternoon of imaginative play outside near the trees. Win win! In the Doc Mobile game, Doc has a mobile clinic she hooks up to her bike to go and visit those toys that need her help. Tara absolutely loved this concept and asked if we could set up our own mobile hospital just like Doc. We have been doing a lot of ‘hospital play’ lately and have quite the medical collection of bits and pieces in our hospital prop box but I have noticed them getting frustrated when they try to wrap the big bandages around their toys (or me! )and we have been going through more bandaids than I would like just because their toys have a sore that needs fixing (repeatedly apparently) so I decided we would make some felt bandaids and bandages that would be easier to use for little hands and could be reused over and over. 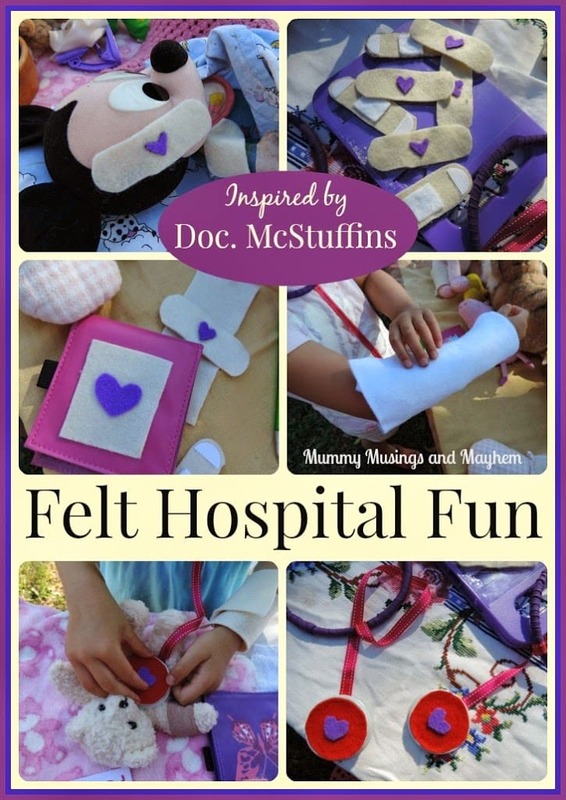 Since they are loving the Doc at the moment I thought I would put a little McStuffins inspiration into our creations. 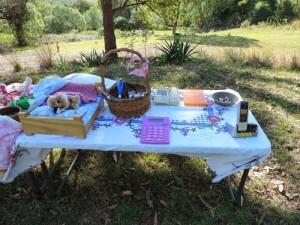 We made our crafty treasures for the medical kits in the morning then headed out in the afternoon to pick a shady spot to set up the Doctor Clinic (tables)…the closest I could come to meeting Tara’s ‘mobile clinic’ wish. Ruby said it was like Doc’s ‘backyard hospital’ which I figured was high praise from a 4 year old! I set up a few calculators and old phones as well as some folders and pebbles for money. 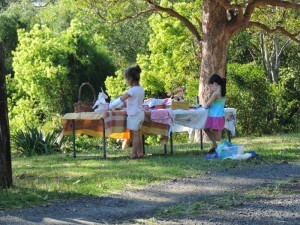 The girls decided that one table was the clinic and waiting room and the other end was their office. I made the mistake of putting a few of the toys on the office table and was severely reprimanded…don’t mess with two 4 year olds in their imaginary world! 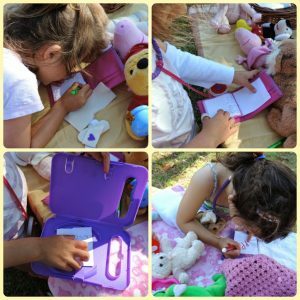 Here’s what we made (well mainly me to be honest, but the girls had fun making their own creations with felt, glue and pens….and more glue and they did enjoy helping me with some of the easier parts of the crafting). 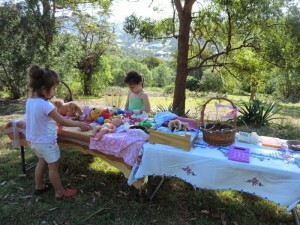 They are all quick and easy projects that anyone can do and the girls were absolutely delighted with them. Aren’t these cute? 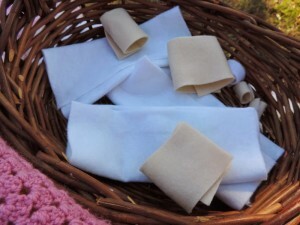 I was really pleased with them and they were so easy to make – no sewing involved! 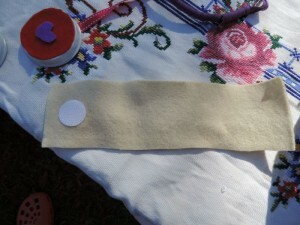 I simply cut out bandaid shapes from brown felt then glued a white square of felt onto the bandaid to form the pad. 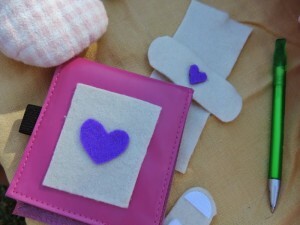 I added a felt heart to the front (just like Doc McStuffins of course) and cut a Velcro dot in half (the rough side) to stick to each end of the bandaid. The rough pile of the Velcro will hold onto soft toys. If you want to make them stronger you could sew the felt pieces on but I wanted the girls to be involved and they loved gluing the pieces on to help with the project. 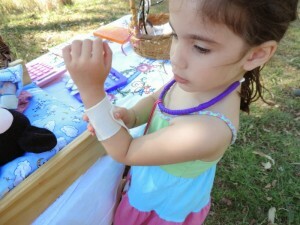 Their toys were given the very special heart bandaid treatment and I didn’t have to raid my own first aid kit! 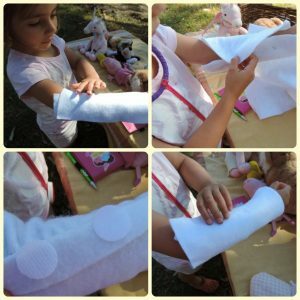 To make large bandages that would wrap easily around the girls own limbs I cut strips of various sizes from felt scraps, added a few Velcro dots to the end and they were ready to go! 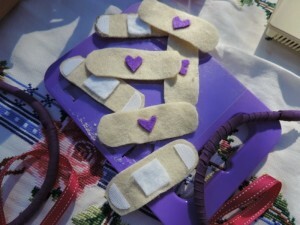 The Velcro presses and sticks to the felt and the bandages are then easy for little hands to open and press closed. I also used a piece of white felt and some stick on Velcro dots to make a pretend plaster cast. The girls absolutely loved this one and Tara informed me she would be wearing it to preschool to show everyone her ‘sore arm’. Such a quick and easy little project but they found so many ways to put that cast on each other. The beauty of the Velcro dots only along one edge is that you can pull it snug to fit the skinniest little arm or let it out a bit for those a little bigger. It will literally take you 2 minutes to make I promise! 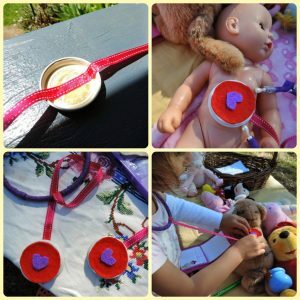 We did already have some stethoscopes in our doctor’s box but I decided to make some special ones that looked a little more like the one their favourite Doc wears. Very easy to make, I just used materials I already had. First I wrapped some old bias tape around a couple of headbands that have been languishing in the bathroom cupboard for ages. I glued the edges down with some PVA glue but a decent glue gun would make the job easier and probably help the stethoscope withstand more love! 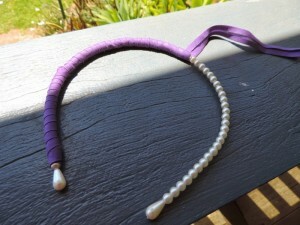 The last step just requires a little ribbon glued to the headband and then to the lid as shown in the pictures. It’s a good idea to wrap the ribbon around the band a few times before gluing into place just to make it a little stronger when small hands are tugging on it. Told you it was easy. The girls wore them all afternoon and liked that they didn’t need to stick anything into their ears which they don’t like about the other ‘real’ stethoscopes. 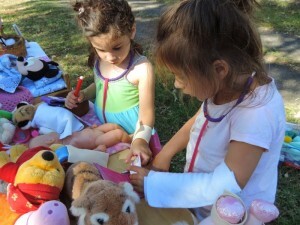 My girls just love writing in books at the moment so of course we had to have a boo boo book just like Doc McStuffins! 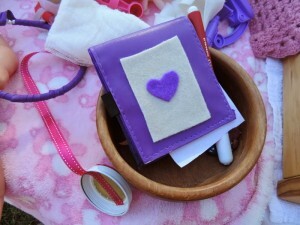 I simply used a couple of notebooks they already had and glued a few little pieces of felt onto the front cover. Their use promoted a lot of reflective language and conversation and were a fantastic way to practice those pre writing skills. 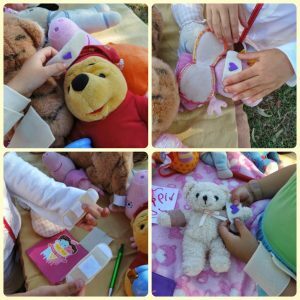 I was in awe of how professional those two were writing down all the signs and symptoms and then coming back to fix each toy after making a diagnosis, it was too cute! They were busy being Doctors all afternoon and every toy had to wait their turn to be fixed in the waiting room. It was very important work! 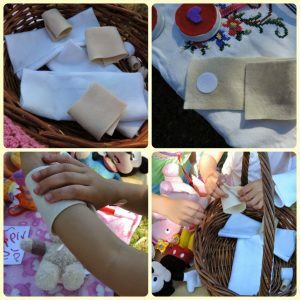 Why not make some of your own felt bandaids and bandages; you might be surprised at how long some little bits of felt can keep them busy! 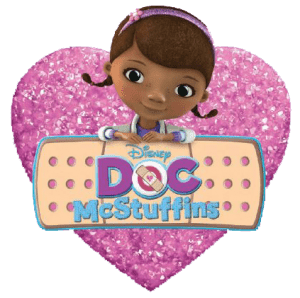 If you have been inspired by our Doc McStuffins clinic play but can’t view the Disney Junior channel on your TV why not share more of her adventures at Disney Junior website or on i-Tunes?. To ensure you are able to see the full range of new games and activities available online at Disney Junior make sure you view the site on your laptop or desktop computer. 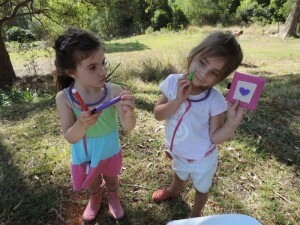 You too might soon hear the phrase “The Doc is in” from your own cute little doctors! 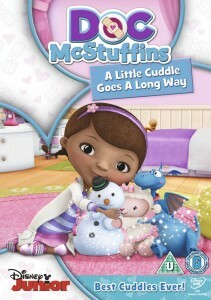 Do you have some Doc McStuffins fans at your house? Just answer the following question to be in with a chance to win this fantastic prize pack. The most creative answer as decided by myself and our Disney Junior representatives will be chosen as the winner! 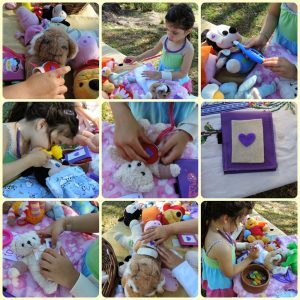 What toy would your child most like Doc McStuffins to come and fix if she could and why? Entries will close at 5:00 pm AEDST on Tuesday 14 October 2014. Full terms and conditions of this giveaway can be seen here. 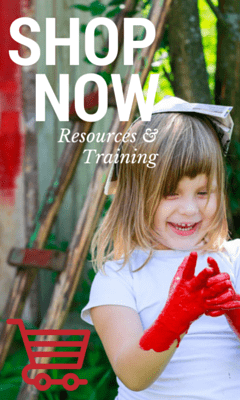 « 15 Creative Mummy Hacks to keep children entertained! I think they would love the Doc to come and fix the toy drum set that my ‘lovely’ sister gave my kids, it ‘accidentially’ broke! I love all your band aids and bandages and stethoscope …such fun…looks like you’ve got a lot of sick dolls there, you might have to check what they’ve been up to! 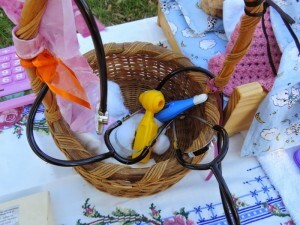 I just ADORE your homemade hospital kit, how incredibly creative! 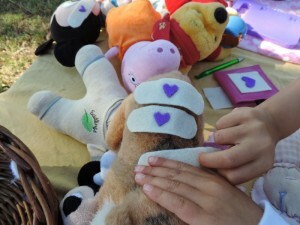 We will definitely have to make some bandages here for stuffed animals, too cute! How clever is this! Love how you were able to make all those things so easily. 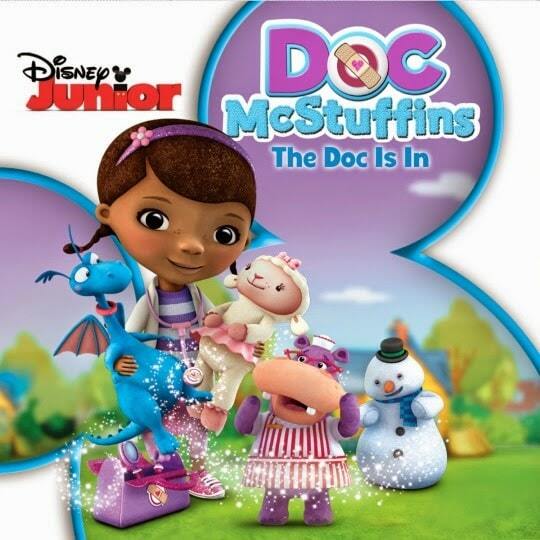 I didn’t know about the Doc McStuffins so you’ve introduced me to this too. My 3 yr old LOVES Doc Mcstuffins! She would ask doc to fix all of the pieces that have come off her Barbie house. How cute and fun are your Dr kit items!! My daughter will love these, thanks for the awesome ideas Jode! We currently have a toy dog who’s insides are on the outside… I think we need the Doc at our house! I work as a wildlife education officer and that rubs off on my girls. They love playing vet and their animal toys get hurt and fixed the most. 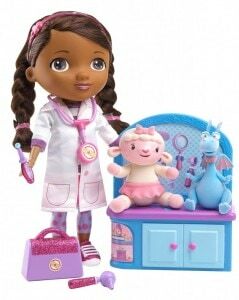 I think it’s so important for children to build empathy and compassion for our fellow creatures and I’m sure Doc McStuffins would help the girls to fix their animals too. What an enviable set up! 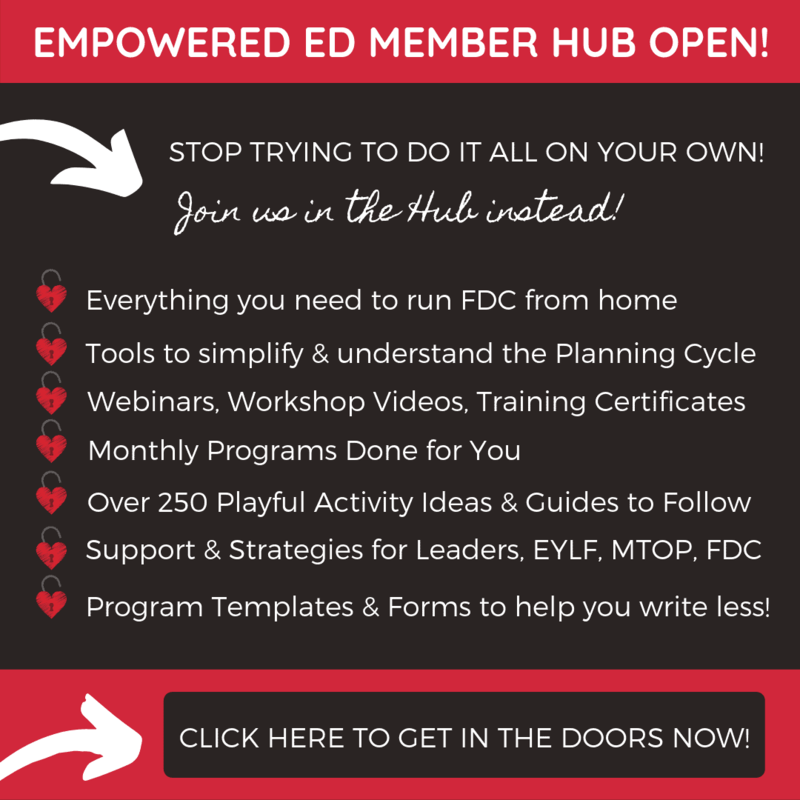 How fun and exciting! We are new Doc McStuffins fans here too! My daughter would love Doc to come and fix her favourite baby doll who has lots of boo boos and appears to be suffering from Fall-over-atosis. My kids have many times played pretend vets, fixing up their sick animals (stuffed toys). 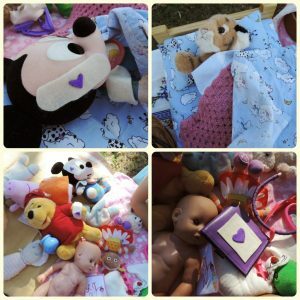 Doc McStuffins would be great to include in these pretend games and fix up my daughter’s rabbit (she calls Cuddly) She is a very much loved toy rabbit with no stuffing left, that MUST come with us everywhere! I just found your blog! I also have 4 year old twin girls that love Doc McStuffins. I’m pretty sure the show has inspired them both to be doctors when they grow up as they talk about it frequently. My girls would ask for all of their stuffed animals that need a booboo fix (sewn) to be fixed since momma can’t sew. My daughter would have Doc come fix her her Doc McStuffins figurine whose head broke off and so she has what some may call headache-o-titis! I would love to win this for my grand-daughter, who is a big Doc McStuffins fan. I’m sure she has lots of friends at home that she would love to have the Doc visit, but I’m thinking I would love to have the Doc live at my house, so there is even more fun here when my grandie visits me. I can just imagine her face when she comes to stay and sees the Doc on the toy shelf. Oh my goodness,I love this idea!!! So awesome,I just made my 4 year old and her stuffed animal puppy “capes” from daddys old shirt! & we painted toilet paper rolls and made them the cuffs to match the capes. We have this baby doll that the girls colored on so it looks like she has ouchies, I know for sure my toddler would use the band aids on her and kiss her and say “all better” just like mommy does for her! They would check the heart on this pink build-a-bear we got that we had put a heart beat sound maker in it!